Presented here, a pleasing small 19th C. Folk Art Painting, Oil on Canvas scene of Burns Pond at Whitefield, New Hampshire with Twin Mountains in the distance by A. E. Harris, dated 1894. It comes out of the family estate, in totally untouched condition. Colors and surface are great. A.E. 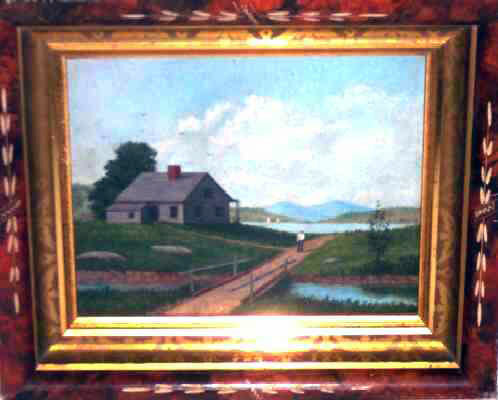 Harris lived on Kimball Hill in Whitefield, NH, and her paintings of such scenes from the Whitefield area are highly sought after for their attention to detail and real-place depictions. This nicely detailed view depicts a house, a man on a boardwalk, and Burns Pond with Twin Mountains in the distance. In it's original frame, it measures 9 x 7 (sight) and 13 x 12 overall. The frame is a liner from a larger Victorian picture frame and is nicely carved and painted and in overall fine condition showing only minor wear.